Families are driven. What drives your family? I see two family models. Culturally-driven family and values-driven family. One is more popular than the other. Can you guess which one? If you guessed the culturally-driven family you are correct. Now, do you know which model will give you the most mileage? If you guessed the values-driven family you are also correct. One final question. What model do you prefer? The more popular–culturally-driven model? Or, does the values-driven model make more sense for you? Let’s take a closer look at these models. A culturally-driven family is always on the move. From dawn to dusk, this family is driving on all cylinders. No time for a potty break, a culturally-driven family has places to go and things to do. Work, school, activities, programs, rehearsals, events are major stops in a busy day. A culturally-driven family is motivated by worry. Cultural values suggest you need to expose your kids to the best of everything if you want them to succeed. By all means, you must provide them the best to look successful. Feeling pressure, parents bust their butts to achieve this culturally-driven expectation. Parents scurry about from soccer field to baseball field, from hockey rink, to gymnasium, from music studio to dance studio. Reacting to the pressure to keep up with the trends in fashion and media, culturally-driven parents spend a lot of money, even if it means going into debt. Finally, culturally-driven families are chronically stressed and exhausted. They wonder how long they can keep up the pace. They also worry about the effect is has on the family. The problem is they don’t know how to slow down. A values-driven family is also on the move, but at a healthy pace. The weekly calendar is full but it includes scheduled time for personal and family activities. Family connections take priority over social opportunities. Parents use discretion in determining how much social activity to pack into the weekly schedule. A values-driven family is motivated by love and passion for connection. They know life is short, that kids grow up quickly, and they want to make lasting memories. Time spent together strengthens family bonds and provides opportunity to instill values. You can tell a values-driven family by the absence of chronic stress. They enjoy life because the pace is manageable. 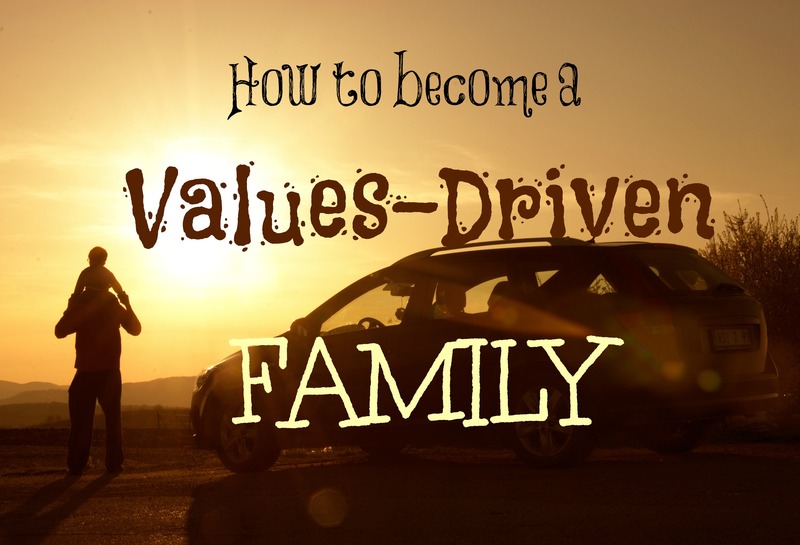 If you want to be a values-driven family here are some suggestions. Do you have family values? Can you articulate them? Do your kids know what they are? Are they visible? Do you model them to your kids? These are some questions I recommend you spend some time answering. Once you are clear on your family values it is important for you to implement them in your home. Parents, you are the primary influencers in your kids’ life. Do not delegate this assignment to professionals. In the course of daily life you have ample opportunity to teach your children about values such as respect, honesty, responsibility, faith, and compassion. It’s more than telling them what to do, but why the value is important. The most powerful way to teach values is by modeling them at home. Look at your calendar. Does it reflect your values? If you want to be a values-driven family, your calendar will need several time slots for connecting. This means you will have to adjust your pace and eliminate some activities that crowd space. For more on this read my blog, Are You a Family on the Run, or Family Having Fun?. I encourage parents to re-introduce the family mealtime. This is a setting to make powerful connections and reinforce the value of togetherness. If you have dinner on the run, I suggest you begin with setting a day or two a week where you have dinner together as a family. Keep the schedule loose that night so you do not have to run out to an appointment or activity. Hang out at home together. Play a board game. Go for a walk. In culturally-driven families, parents have few expectations for their kids. Parents also do way too much for them. I say go retro and reintroduce chores! Teach your kids that another way to be a part of the family is by making a contribution. Giving age-appropriate chores is important in your child’s development. I cover this extensively in my book “Bringing Respect Back: Communicating Without the Conflict”. There is much more I can say on this topic. Hopefully what you read will give you a place to start. Once you know what type of family you are, you can decide what to do next. If you are a values-driven family I would like to hear what you do to make it work. Please leave comments below or on my FaceBook page. If you are a culturally-driven family, what do you plan to do to begin making the shift to a values-driven family? I’d enjoy hearing comments from you too.